Pleasantville Secondary will represent the Secondary Schools Football League (SSFL) South Zone in the 2018 Shell/First Citizens Bank Big 5 competition, which carries the potential for promotion to next season’s Premier Division competition. Pleasantville open their campaign from 3:30pm today against Holy Cross College at the Mannie Ramjohn Stadium in Marabella. 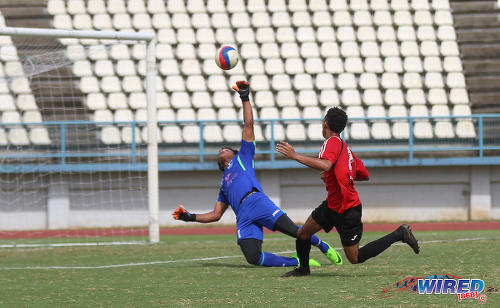 Malick Secondary and Chaguanas North Secondary played to a 3-3 draw yesterday while the Tobago representative—either Speyside High School or Mason Hall Secondary—will be confirmed this weekend. Photo: A Pleasantville Secondary player (foreground) comes to grips with relegation from the Premier Division after a 3-1 defeat to Shiva Boys Hindu College in SSFL Premier Division action in Pleasantville on 22 October 2016. The top three schools from that quintet will match wits with the likes of Presentation College (San Fernando) and San Juan North Secondary, live on SportsMax, in the Premier Division next year. 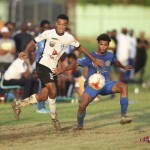 However, Moruga Secondary are still scratching their heads as to why Pleasantville got that honour ahead of their own school, after a controversial ruling by the SSFL executive, on 17 October, regarding the eligibility of Pleasantville Secondary goalkeeper Raheem Lee. 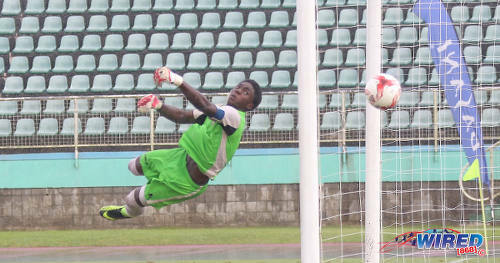 Lee kept two clean sheets when Pleasantville met Moruga on 18 September and 5 October, as the former team won handsomely by an eight goal aggregate score. 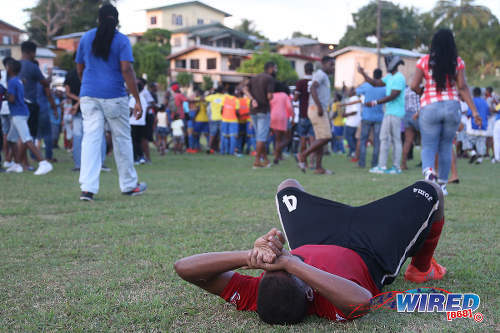 However, Moruga, who finished in second place and nine points behind Pleasantville, were convinced that the results should not have been allowed to stand since, they contend, the goalkeeper ran afoul of Credentials Committee rules. 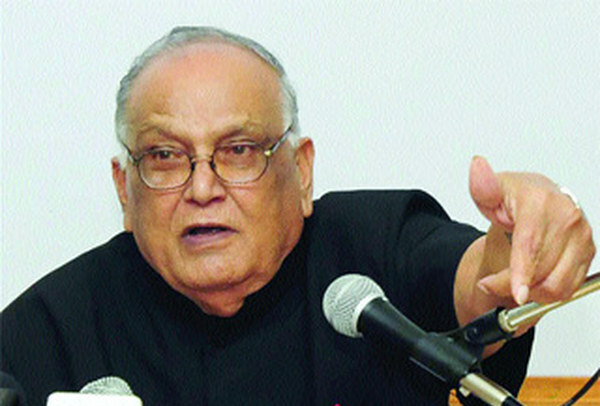 The SSFL’s response, which came two days later, was brief. Toussaint, a former Moruga school football captain, said he was confused by Khan’s letter. “After we got the email from Khan, I contacted the SSFL office and I told them that that is not what we were asking,” said Toussaint. “But to date, nobody has contacted us again. We are asking if he qualifies to play football! 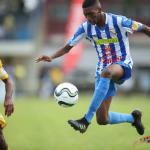 Photo: Naparima College midfielder Rushawn Murphy (right) prods past Pleasantville Secondary goalkeeper Raheem Lee during Coca Cola Intercol South Zone quarterfinal action at the Mannie Ramjohn Stadium on 10 November 2017. The SSFL’s Credentials Committee rules mentions CVQ just once; and that is with respect to a Form Five Transfer repeat, which does not apply to Lee. The Caribbean Examinations Council (CXC)—as mandated by the Council for Human and Social Development (COHSOD) XV—is the awarding body of the CVQ to students in secondary schools throughout the region. CXC’s prime responsibility is quality assurance of CVQ programmes and performs no evaluation function for CVQ. 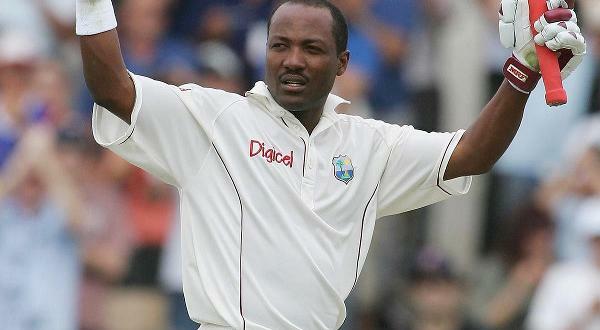 However, Khan told Wired868 that Lee’s CVQ pass was adjudged to be the equivalent of a CSEC pass. 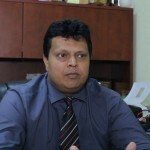 Ironically, the SSFL used Rule 13 to arrive at a different result in the case of Arima North Secondary, who were stripped of 15 points—on 10 October 2018—for the illegal registration of Josiah Joseph and brothers Leandro and Leonardo Da Costa. Photo: Holy Cross College player Daniel Hernandez (right) beats Trinity College East goalkeeper Emmanuel John but sees his chipped effort clear the bar during Intercol East Zone quarterfinal action at the Larry Gomes Stadium on 8 November 2017. The three players were transferred into Arima North Secondary for the new academic year with only one CSEC pass each to their name. 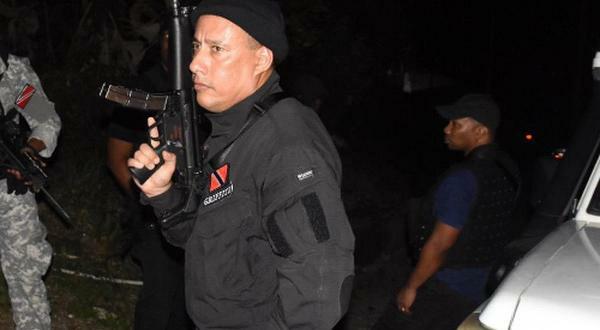 Joseph is a former Success Laventille student while the brothers came from Arima Government Secondary. All were placed into Form Four. Rule 4 of the Credential Committee’s bylaws states that Form Five Transfer Repeats must have a minimum of two CSEC passes. 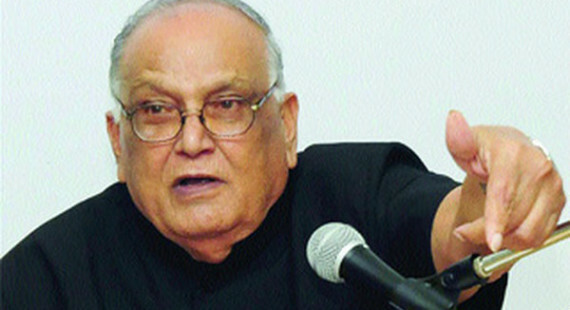 And, after Holy Cross lodged a protest, the SSFL declared, using Rule 13, that Arima North violated the spirit of the law, although its bylaws was silent on their creative transfer. It is ironic, then, that Pleasantville and Holy Cross would face each other in their respective bids for a Premier Division spot. 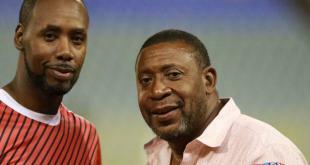 Toussaint insisted Moruga have not conceded yet. But, for now, it is Pleasantville who will continue to chase schoolboy glory in the Big 5 competition. 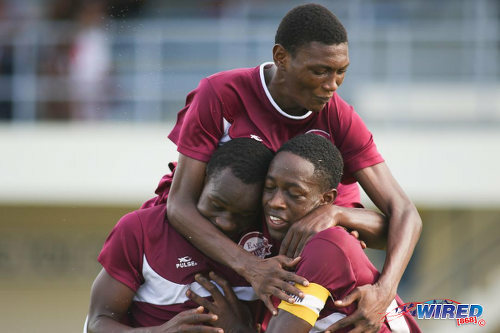 Photo: East Mucurapo attacker Zidane Lewis (top) celebrates with his captain and goal scorer Kevon Edwards (right) during SSFL Big 5 action against Valencia Secondary at Mucurapo Road on 29 October 2017. East Mucurapo and Valencia were promoted to the Premier Division for 2018. Malick Secondary 3, Chaguanas North Secondary 3 at St Mary’s College. 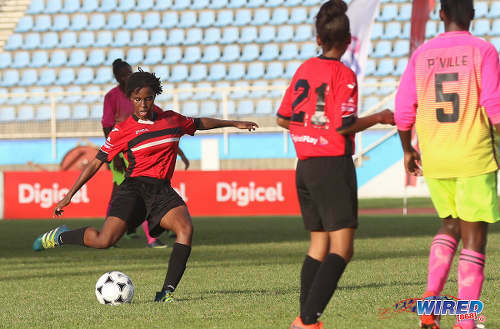 Photo: Bishop Anstey Port of Spain midfielder Ranae Ward (left) shoots at goal during Coca Cola National Intercol final action against Pleasantville Secondary at the Ato Boldon Stadium on 4 December 2017. Ward scored a hattrick as Bishop romped to a 6-0 win. 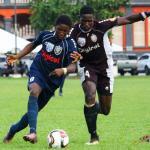 Pleasantville Secondary vs Bishop POS/Carapichaima East, Girls Semis, 3:30pm, Mannie Ramjohn Stadium.